1Research and Development Department Microfertisa. Bogota (Colombia). cluengas@microfertisa.com.co. 2Department of Plant Health and Nurseries. Palmar del Llano. Fusagasuga (Colombia). 3 Commercial technical representative, Interoc. Bogota (Colombia). Received for publication: 23 May, 2011. Accepted for publication: 29 June, 2012. Anthracnose is the most limiting disease in the production of the tree tomato; losses may exceed 50% if control measures are not appropriate. For this reason, farmers use continuous applications of fungicides. Prebiotics have been successfully tested in animals and humans in order to stimulate the growth of intestinal flora and fauna to improve digestion, achieve greater increases in weight, reduce infections and stimulate the immune system. In plants, there are no data on their effectiveness in disease control, for this reason, this research was conducted on the La Esmeralda farm located in the town of Silvana (Cundinamarca, Colombia); to evaluate the effect of a prebiotic (BioKakimu®) and potassium dose on disease control. We determined the incidence and severity of anthracnose, and crop production. We used a complete block design with three replications and twelve treatments, each experimental unit consisted of six plants, for a total of 216 plants and an area of 1,350 m2. The crop was 18-months-old and consisted of the common red variety. The results showed that the foliar incidence, severity and production had significant differences between the various treatments, where the prebiotic - K2O interaction showed favorable results for disease management in high doses of prebiotic (6 L ha-1). Key words: disease control, Solanum betaceum Cav., fertilization, fruit. La antracnosis es la enfermedad más limitante en la producción de tomate de árbol, las pérdidas pueden ser superiores al 50% si las medidas de control no son oportunas. Por tal razón el agricultor realiza aplicaciones continuas de diferentes fungicidas. Los prebióticos han sido probados con éxito en animales y seres humanos con el fin de estimular el crecimiento de la flora y fauna intestinal para mejorar la digestión, lograr mayores incrementos de peso, reducir infecciones y estimular el sistema inmune. En plantas no existen datos sobre su eficiencia en el control de enfermedades, por tal razón se condujo esta investigación en la finca La Esmeralda ubicada en el municipio de Silvana (Cundinamarca, Colombia), con el objetivo de evaluar el efecto de un producto prebiótico (BioKakimu®) y dosis de potasio sobre el control de la enfermedad. Se determinó la incidencia y la severidad de antracnosis, y la producción del cultivo. Se empleó un diseño de bloques completos al azar con tres repeticiones y doce tratamientos, cada unidad experimental estuvo constituida por seis plantas, para un total de 216 plantas y un área de 1.350 m2. El cultivo tenía 18 meses de sembrado con la variedad rojo común. Los resultados mostraron que la incidencia foliar, la severidad y la producción, tuvieron diferencias significativas entre los diferentes tratamientos, donde la interacción prebiótico - K2O presentó resultados favorables para el manejo de la enfermedad en dosis altas de prebiótico (6 L ha-1). Palabras clave: control de enfermedades, Solanum betaceum Cav., fertilización, frutas. The tree tomato (Solanum betaceum Cav.) is a wild plant adapted to shaded regions of temperate and cold areas with a high relative humidity, altitudes between 1,500 and 2,600 m, and average temperatures between 16 and 22°C; it can withstand temperatures of 0°C without serious harm. The water requirements are 1,500 to 2,000 mm annually. Plants must be protected from the wind to prevent tearing of the fragile branches (Angulo, 1990). The crop grows best in loose, deep and well drained soil that is rich in organic matter. To ensure adequate drainage and good moisture retention, soil texture can vary from loam to loam-sandy. The pH should be neutral or slightly acid from 5.5 to 6.5. It can grow on flat soils and soils with a maximum gradient of 50% (Corpoica, 2000). Within the health constraints are viruses such as the "oily stain" of Nariño (Salazar-González et al., 2010), AM V, CMV and PLRV found in Antioquía (Jaramillo-González et al., 2011) and PLRV, CMV, TS WV, and others that have been detected in live materials (Álvarez et al., 2011). Among the fungal type diseases, the fungus Colletotrichum gloeosporioides Penz. and the newly discovered species Colletotrichum acutatum (Saldarriaga- Cardona et al., 2008) are today a serious constraint to crop production for the tree tomato in all regions the country; causing crop losses exceeding 50%, forcing, in most cases, abandonment or crop substitution, usually after 3 years. The incidence and severity are so serious and the environmental cost so high that commercial crops under conditions of continuous use and with weekly fungicides have losses ranging from 10 to 25% of the harvested fruits (Aranzazu, 2000). This disease attacks the leaves and fruits; in the foliage, color spots appear dark; in the fruits, injuries occur that affect the skin and occur when plants are in full vegetative growth if the humidity reaches 95% and the temperature is above 17°C, often resulting in losses of up to 90% (Fnfh-Asohofrucol, 2007). With the host attack by C. gloeosporioides, the disease is considered paramount and in the tree tomato, mango and guava, for example, it is one of the most limiting diseases. However, in avocado, citrus, papaya and passifloraceaes, it is secondary (Saldarriaga- Cardona et al., 2008; Navarro and Puerta, 1981). Studies on the infection and epidemics of the disease have determined that the leaves, stems, young shoots, clusters, buds, flowers, sepals of the flower and fruit in any state are potentially susceptible to the fungus; reason enough for the definition of management alternatives that must develop integrated alternatives in the management of the tree and inoculum (Rondon, 2004). According to Luna and Osorio (1993), so far what has been done to control the disease include suspension of irrigation, phytosanitation pruning, and chemical applications, these being the only control strategies used by producers, thus ignoring the whole behavior of seeded varieties to the disease, however, there are studies that can provide, in the medium term, the acquisition of tolerant or resistant materials as seen in the study of Lobo et al. (2000), who found resistance to the disease in some accessions of C. uniloba. Among the alternatives to control the disease, one sees the application of different levels of potassium to the soil. Reuveni et al. (1997) cited the annual US DA journal dedicated to plant diseases which says that the use of potash fertilizers has delayed more plant diseases than any other substance. When potassium helps plants resist disease it does so indirectly by strengthening the natural resistance mechanisms of plants. K strengthens stems against invading organisms; the cuticle hardens against attack by mildew and other infections, making the cells more turgid, less suitable for certain diseases that invade after rain falls. The complex relationship of K nutrition with metabolic functions and growth, as well as its interaction with other nutrients within the plant and soil, allow K to change the resistance or susceptibility to disease; Huber and Arny (1985) stated that potassium probably has a great effect on the disease, through a specific metabolic function that alters the environmental compatibility of the parasite-host relationship. K is also involved in the defense mechanisms of plants to pests and diseases. The incidence and severity of damage caused by insects and fungi are markedly reduced in plants nourished with K; this is due to the fact that high concentrations of K in the tissues favor the synthesis and accumulation of phenolic compounds, which act as inhibitors against insects and fungi. Furthermore, K deficient plants exhibit less dense tissues as a consequence of reduced thickness of the cuticle and cell walls, less formation of sclerenchymatous tissue, and less lignification and suberization. Plants nourished with K have an increased synthesis of material for cell wall formation. The accumulation of these phenolic compounds alter the osmotic balance of the cells and the exudates released by the plants have a higher concentration of these compounds, a situation which favors the development of diseases (Dell, 1996). Agrios (1996) described the importance of phenolic substances in inhibiting the establishment of pathogens in plants; phenols are attached to other particles such as non-toxic glycosides, which attempt to dissolve the active substances in bacteria and fungi; with the decomposition of these compounds formed by glycosides and phenols, phenols are released and become polyphenol oxidases, these polyphenol oxidases are fungitoxic, allowing the plant to respond to the invasion of the fungus. Prebiotics have recently emerged as another alternative in the management of the disease; oligosaccharides are part of a group of substances which are known under the name of prebiotics. Rather than preventing the onset of the disease or playing an essential role in the tissues of living organisms, their primary function is to serve as a source of energy to the set of beneficial microorganisms found in the organism (FIA , 2008). According to Rodríguez (2005), those food ingredients that stimulate bacterial action are considered prebiotics. Non-digestible ingredients that stimulate the growth or activity of one or more types of bacteria in the foliage, in the plant rhizosphere as solubilizors, or organic matter mineralization are known as functional foods. A prebiotic beneficially affects the host by selectively stimulating the growth and/or activity of a limited number of bacteria that are already populating the foliage or rhizosphere, decaying organic matter. Studies in the food industry have demonstrated the fungicide ability of prebiotics on Penicillium simplicissimum, a limiting fungus in milk production (Cruz et al., 1999). The nutritional action of prebiotics is favored by the high content of biominerals, also known as organic minerals, protein minerals, bioplexes or metalloproteins: Minerals transition (Cr, Mn, Fe, Co, Ni, Cu, Zn), linked short-chain peptides having a higher capacity to increase the bioavailability of minerals in the organism tissues, with greater effectiveness if the molecular weight is less than 800 Da and it has been proven that the pH and electrical neutrality are stable, showing high stability before and after being mixed with other raw materials (Ramírez, 2008). In order to evaluate preliminary and exploratory applications of prebiotic substances, this study aimed to determine the effect of different doses of a commercially manufactured prebiotic (BioKakimu®) and potassium fertilization of the soil in controlling anthracnose. This study was developed on the La Esmeralda farm, (Sylvania, Cundinamarca, Colombia), with an elevation of 2,300 m a.s.l., 4°28'12.22" N, 74°22'14.9" W. We used a variety of common red tamarillo that was 18-monthsold, planted at a distance of 2.5 x 2.5 m. The experimental design used in this investigation was a randomized complete block with three replications. Each experimental unit consisted of six plants for each of the 12 treatments (Tab.1), totaling 216 plants for the trial, with a total area of 1,350 m2. 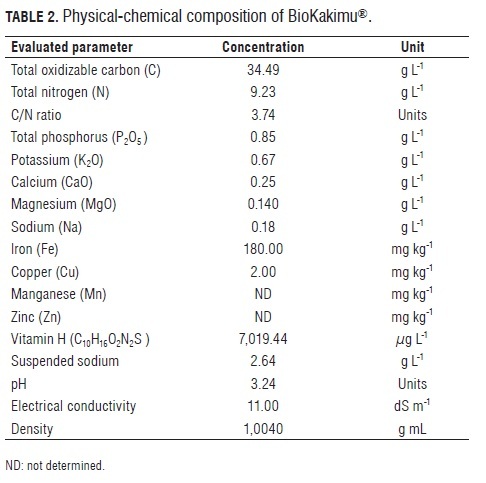 For the prebiotic, BioKakimu® was used, with the product characteristics seen in Tab.2. During the course of the experiment, three applications of the prebiotic were employed, with the first application during week one and the following applications with an interval of 3 weeks. For the potassium fertilizer, KCl was used and performed in the first and fifth weeks. During the trial, no pests or diseases were seen. The response variables evaluated were incidence and severity, conducting weekly sampling of the six plants of each experimental unit. We counted the total number of leaves and the number of affected leaves and established the percentage of leaf area affected by visual estimation; on the same plants, the total fruit number was counted weekly and the number of healthy fruits was counted at harvest; yield was evaluated on crops fortnightly, when the production of the six plants of the experimental units was weighed. The data were processed in SPSS ® 11.5, performing variance analysis and comparing the means by Duncan's test at a significance level of 95%. Significant differences were found between treatments, when using the Duncan mean comparison test (Tab.3), showing that the number of affected leaves, leaf incidence and severity of the treatments that did not contain the prebiotic (10.12) presented values denoting greater presence of the disease and disease attack at the leaf level. One could argue that the initial response to the application of potassium was not effective in reducing the pathogen attack, contrary to what was stated by Huber and Arny (1985); but shows the application of potassium in 300 k g-1 increases the number and percentage of healthy fruits produced versus the absolute control, indicating that somehow applications of this element decrease the pathogen attack, similar to that found by Mascarenhas et al. (1995) in the control of Phomopsis sp. in soybean and by Junior et al. (2003) for Cercospora coffeicola in coffee. The prebiotic treatments had significant differences when compared with the control with respect to the amount of healthy fruits and percentage thereof. With respect to production, there were significant differences between almost all the treatments that had some dose of potassium and the prebiotic versus the absolute control; only treatments 3 and 10 showed statistical similarity. By observing the correlation analysis (Tab.4), one sees the explanation of the response; the yield per plant was determined by the number of good fruits per plant and these depended on the incidence and severity of the disease rather than the amount of total leaves, i.e. it can be established that the reduction in production depends not on the number of leaves of the source but on the health of these, while the foliar incidence and severity determined the number and percentage of healthy fruits. If measures of effective control are not done timely, losses could reach close to 100%, as discussed by some authors (Aranzazu and Rondon, 2001). 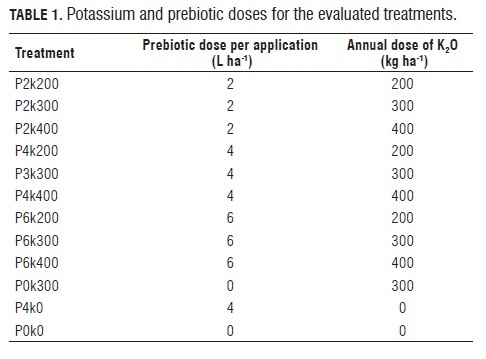 In order to find differences between the absolute control and treatments with mixtures of the prebiotic and potassium, a 3 × 3 factorial analysis of the first nine treatments was used; determining for the prebiotic - potassium factors, the doses with the most efficiency within the trial for controlling anthracnose. As shown in Tab.5, it appears that the prebiotic - K 2O interaction generates a type of tolerance to the pathogen attack. As the analysis shows, there is a prebiotic - K 2O ratio which is the most effective for controlling the pathogenic disease. The most promising result to stop the development of the disease was observed with doses of 6 L ha-1. The best dose, as a smaller number of affected leaves was found, was with low doses of the prebiotic. But, this measure is affected because it does not generate a clear trend of what it does, because the number of leaves is not similar in all sampling units, therefore the percentage of and affected leaves make more reliable parameters for evaluation. The percentage of affected leaves showed no statistical difference for the treatments with higher and lower doses of the prebiotic and K2O. The incidence rates were evaluated directly on the affected leaves, independent of the degree of severity that was reached, since for this case the incidence is a percentage of affected leaves over the total number of leaves, but does not indicate the degree of affected leaf area and its relationship with the yield (Dell, 1996), reported that potassium is a precursor of defense mechanisms; and incidence and severity are significantly reduced in plants nourished with potassium. This is because high concentrations of K in tissues favor the synthesis and accumulation of phenolic compounds, which act as inhibitors of fungi. Severity is a parameter that complements the plant response to attack by a pathogen. In this regard, it was found that the highest dose of the prebiotic decreased or prevented the increase of the disease. Prebiotics can be regarded as precursors of active resistance when defense reactions are activated as soon as the parasitic organism invades the plant tissue. The production of compounds such as pisatin in pea, hydroxyfphseolin in soy and phaseolin in beans enhances cells around the site of penetration or injury and the biostatic or biotoxic activity, and has a very broad range: against a large diversity of microorganisms; this active defense is limited to the site of injury or attempted infection (Niks and Lindhout, 2003). Another active defense mechanism is the production of pathogenesis related proteins (PR). The plant produces such proteins as a response to infection, injury bite or other stress. PR proteins systematically occur throughout the plant. Plants producing PR proteins show a high level of resistance against many natural enemies. This effect is called induced resistance or acquired systemic resistance (Soliver and Knight, 2003). The number of flowers variable had significant differences for the prebiotic factors, with the highest dose having generated a greater number of flowers per plant (data not shown). It is possible that this effect is not attributable to floral induction, but to a greater possibility of flowering in healthy plants than in sick ones. Applying mixtures of potassium and Biokakimu can generate a lessened effect of anthracnose on the tree tomato. The doses that showed better responses in terms of fruit production per gram were: prebiotic (6 L ha -1) and potassium 400 kg ha -1, representing a good alternative in the integrated management of the disease, even though severity and incidence of the disease have increased with increasing doses of potassium. The application of prebiotics and potassium is a viable alternative for the integrated management of anthracnose in the tree tomato, and therefore a possible reduction in the application of fungicides, bringing the fruit market a product with less traces of pesticides. Based on these results, we recommend the application of prebiotics in doses of 6 L ha -1 and potassium in doses of 400 kg ha -1 (this can increase fruit production) in the cultivation of the tree tomato as a supplementary measure within an integrated management of the disease and cultivation. There should also be a marginal analysis of the cost-benefit ratio in future studies to look at the feasibility of applying probiotics, its viability in crops and to address its management with fungicides. The authors wish to thank Sisvita Biotechnologies S.A., especially Dr. Francisco Ramirez, for his constant support and guidance. Conflicts of interest: this manuscript was prepared and reviewed with the participation of all the authors, who declare that there is no conflict of interest that threatens the validity of the results presented. Financing: "This study was funded by the authors in collaboration with Sisvita Biotechnologies S.A."
Ramírez, J. 2008. Los prebióticos como promotores de crecimiento y de inmunidad en plantas. Sisvita Biotehcnologies, Bogotá [ Links ]. Soliver, J. and J. Caballero. 2003. Aproximaciones biotecnológicas para la producción y ensayo de compuestos inductores de mecanismos de defensa en plantas. Universidad de Alcalá, Alcalá [ Links ].